AFMC MBBS 2019: Armed Force Medical College is a medical college is Pune, offers admission into various courses like MBBS, BSc Nursing, Post Graduate, Super speciality and PG Diploma. AFMC doesn’t conduct any entrance exam for the admission. AFMC 2019 Admission will be done on the basis of NEET Score. It will be started after the NEET Result announcement. The authority will declare the merit list based on NEET Score. Then admission will be followed by screening. AFMC will invite the application form in the month of June. Eligible & Interested candidates can apply online to take part in admission process of AFMC. To appear in the AFMC admission procedure, candidates must appear in the NEET conducted by CBSE and also qualify the exam with good marks. AFMC conducts a test i.e. ToELR of 80 Marks followed by Personal Interview round. AFMC UG Admission 2019 is organized by the AFMC Pune. It is necessary to know all the dates related to admission process. Here we are providing you the AFMC MBBS 2019 Exam Date. These are not official dates. We will update you with the actual dates of counselling after the release of notification by the authority of AFMC. AFMC, Pune will be responsible for deciding the AFMC MBBS Eligibility Criteria. All candidates must satisfy the criteria prescribed by the official authority. 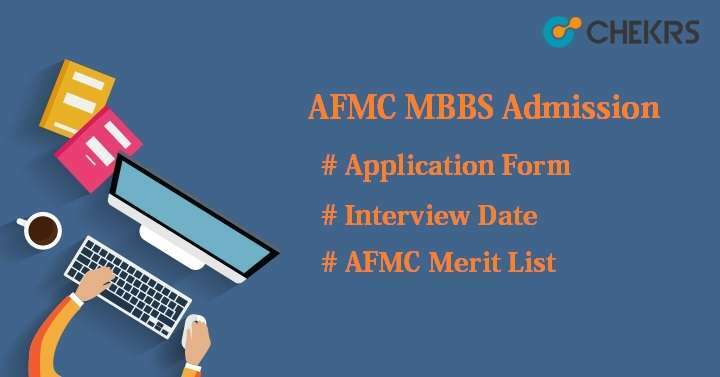 Applicants are advised to ensure the AFMC MBBS Admission 2019 Eligibility Criteria before registering for the admission procedure. Only Unmarried candidates can apply. Candidates must be medically fit (mentally & physically). Fitness will be checked on AFMC standards. On the basis of speech, sight, skin infections, hearing candidates will be examined. Overweight Candidates according to their height will not considered fit for AFMC. Minimum height for girl should be 144cms & weight will be 36 Kg. Minimum height for boys should be 157.5 cms and weight must be 47 kg. For Gorakhas, Assamese and Garhwali, height must be 152.5 cms. Candidate must be Indian citizen. Foreign candidates can also apply but after getting eligibility certificate from the Ministry of Home Affairs. Minimum age should be less than 17 and maximum should be 23 as on 31 Dec, 2019. Candidate must passed 10+2 with minimum 60% marks in PCB from any recognized board. AFMC, Pune will commence the application form after the release of NEET Result. Only NEET qualified candidates can register themselves for the admission process in AFMC. As we know there is no other way to get admission in AFMC. So one must have to appear in the NEET exam and also have to get required cutoff marks to participate in the admission procedure. AFMC Application Form will be available on the official site and candidates have to apply online. Click on the New Registration at left side of the portal. Enter the all required details and click on submit. Login into the account with the generated username/registration no & password. After entering into the account, fill the application form with details like candidates name, father’s name, NEET Score, NEET roll no, etc. After filling all the mandatory details, verify the form and proceed to next step. Pay the application fee through challan. Candidates have to download the SBI Bank challan and pay Rs.250 /- as AFMC MBBS Application Fee with challan in any branch of SBI. No examination will be conducted for admission in AFMC. So there will be no syllabus prescribed by the authority of Armed Force Medical College, Pune. Candidates will have to qualify NEET exam and also have to clear the AFMC Screening Test organized by the authority of AFMC. AFMC MBBS 2019 Cutoff will be the minimum marks required to get shortlisted for the interview/ screening round. It will be decided by the head controller of AFMC. Armed Force Medical College Cutoff will be announced after the release of NEET 2019 cutoff. Cutoff will be declared separately for boys & girls. It will be released on category-wise also. The students whose name will be in the merit list prepared by the official authority of AFMC, Pune will be called for the AFMC MBBS 2019 Selection Procedure. The selection procedure will include 2 more rounds i.e. Test of English Language, Comprehension, Logic and Reasoning (ToELR) and Personal Interview (PI). Total 150 seats are available in AFMC out of which 5 seats will reserved for foreign candidates and 10 seats out of 145 will be reserved for SC/ST candidates. AFMC Merit List will include the name of candidates who will be called for the next round i.e. screening round. A separate merit list will be announced for the candidates who qualified the NEET exam and will be eligible to attend the ToELR & Interview round. The final merit list will be prepared on the basis of NEET Score, written test & interview marks. After conducting the screening round, AFMC MBBS Result will be announced for the selected or shortlisted candidates. Only 150 students will be shortlisted for admission into AFMC, Pune.